On Wings of Eagles: Narnia, He Takes Us Through It. 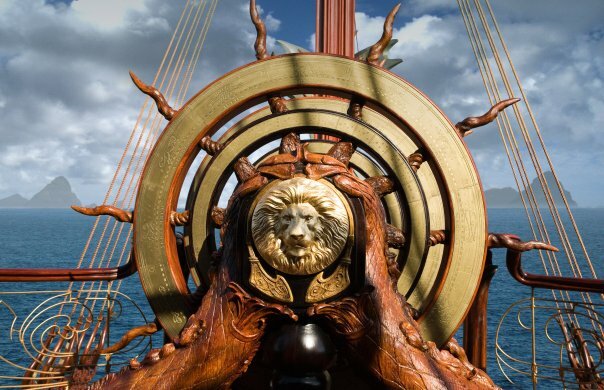 “The Voyage of the Dawn Treader” is a grand adventure. There is excitement. There are risks. There is danger. Just like our own spiritual journey, the young people in the movie wrestle with challenges of all kinds. An important lesson we see in the movie is the fact that like Aslan, Jesus doesn’t rescue us from trouble—He takes us through it. As the movie illustrates evil is quite real. You and I know evil exists in this world, but far too often we ignore it. C.S. Lewis knew the power of Satan, and he wasn’t afraid to present the reality of sin in the world. This powerful story shows us the challenges and obstacles of life. We can see that although evil exists and is very real, God will deliver. There is great hope. Our task is not an easy one, but just like the characters in the Dawn Treader, we have the strength in Jesus Christ to brave the violent seas that are before us. Dear Lord we pray that as we face each day that is before us that we would remember that you are there leading us through. In Jesus’ name, Amen.